High quality caffeine addiction, delivered monthly. Coffee clubs are a dime a dozen. Last time I searched the web 27.9 million sites popped up. Many are from good, honorable roasters who do great work. Why start another? I asked Steve, the managing partner and roast master of Zingerman's Coffee Company. Initially modest, he finally listed a few reasons he makes what I think is some of the best, carefully-roasted coffee you can find. He sees the green bean from farm to his shelves, sometimes visiting to choose lots. He focuses on single varietals to feature the unique nature of each region. Finally, he ensures that each batch receives the kind of roast that suits it best, paying respect to their terroir, the set of geographic and climatic characteristics that make them taste unique. 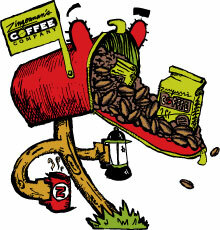 We’ll send out 12 ounces of great tasting, freshly roasted whole bean coffee every month. Your lucky gift recipient will definitely taste the difference, we guarantee it.